Ostriches typically live in arid areas. Arid areas have dry surfaces. Dry surfaces need significant digging in order to create a depth in which an Ostrich can "bury" its head. Is there any scientific research discussing this behavior and noting whether it indeed does or does not happen? Ostriches don't bury their heads in the sand—they wouldn't be able to breathe! But they do dig holes in the dirt to use as nests for their eggs. Several times a day, a bird puts her head in the hole and turns the eggs. So it really does look like the birds are burying their heads in the sand! 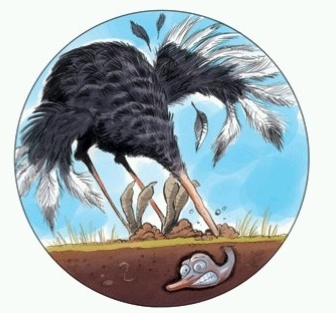 .. that’s a myth: ostriches do not bury their heads in the sand! When an ostrich senses danger and cannot run away, it flops to the ground and remains still, with its head and neck flat on the ground in front of it. Because the head and neck are lightly colored, they blend in with the color of the soil. From a distance, it just looks like the ostrich has buried its head in the sand, because only the body is visible. The ostrich does many things, but hiding its head in the sand is not one of them. or they can try to hide (eg, when nursing the eggs). When hiding, they will sometimes lay flat on the ground, with the long neck and head also on the ground. In the rippling heat haze of their native Africa, they can look just like a grassy mound. There are two theories about how this rumor got started. According to the World Wide Fund for Nature, the ostrich lowers its head toward the ground in reaction to danger, especially when it's sitting on a nest (the female keeps the eggs warm during the day and the male sits on the eggs at night). Male ostriches use their bills to dig shallow nests in the sand and move their eggs around. From a distance, this could look like the ostrich's head is disappearing in the sand. That's the other theory. Not the answer you're looking for? Browse other questions tagged biology ethology zoology .